DALLAS – The Football Writers Association of America, in conjunction with the Allstate Sugar Bowl, announced eight finalists for the 2018 Eddie Robinson Coach of the Year Award on Wednesday. Among the recognized coaches are five repeat finalists from a year ago, a pair of previous winners, and each of the four head coaches in the upcoming College Football Playoff. In alphabetical order the finalists are: Bill Clark, UAB; Josh Heupel, UCF; Brian Kelly, Notre Dame; Jeff Monken, Army; Lincoln Riley, Oklahoma; Nick Saban, Alabama; Dabo Swinney, Clemson; and Jeff Tedford, Fresno State. Notre Dame’s Kelly and Alabama’s Saban are the only former Eddie Robinson Award winners in the group. The 2018 recipient will be announced on Thursday, Dec. 13. The official presentation reception will be on Jan. 5, 2019, in San Jose, Calif., where the winning coach will be handed the Eddie Robinson Coach of the Year bust during a reception hosted by the Allstate Sugar Bowl in conjunction with the College Football Playoff National Championship. The eight finalists have been placed on a ballot which has been sent to the entire FWAA membership. Ballots will be accepted through 5 p.m. ET on Friday, Dec. 7. The FWAA has presented a coaching award since the 1957 season when Ohio State’s Woody Hayes was named the first recipient. The FWAA coaching award is named after the late Robinson, a coaching legend at Grambling State University for 55 seasons. Bill Clark, UAB: After the school’s two-year hiatus from football, Clark’s Blazers posted an 8-4 record during the 2017 regular season and followed that up with the Conference USA title in 2018 paced by undefeated seasons at Legion Field both years. Clark has built a roster from scratch and has recorded the most victories in a UAB season. The Blazers (10-3), 10th nationally in total defense, will meet Northern Illinois in the Cheribundi Tart Cherry Boca Raton Bowl. Clark, who has won C-USA-high 13 league games over the last two seasons, also was a finalist in 2017. Josh Heupel, UCF: In his first season as a head coach in Orlando, Heupel has fashioned a 12-0 record and has continued what Scott Frost, last season’s Eddie Robinson Award recipient, started before leaving for Nebraska. The Knights have the longest winning streak in the FBS at 25 games and will meet LSU in the PlayStation Fiesta Bowl after winning the American Athletic Conference title. The former Oklahoma quarterback, who was previously offensive coordinator at Missouri, has the Knights ranked No. 8 in the College Football Playoff’s final rankings. Brian Kelly, Notre Dame: One of four coaches on the list who has led his team to an unbeaten record (12-0) in 2018. Kelly claimed the Eddie Robinson Coach of the Year Award in 2012 when the Fighting Irish were also 12-0 before losing to Alabama in the Bowl Championship Series title game. Kelly was a finalist for the award in 2009 when he was at Cincinnati. After posting a 4-8 record in 2016, Notre Dame has now won 22 of its last 25 games and will face Clemson in the Goodyear Cotton Bowl in one College Football Playoff semifinal. Jeff Monken, Army: Riding a seven-game winning streak, Army stands at 9-2 before its annual meeting against Navy on Saturday in Philadelphia. The triple-option Black Knights, the nation’s No. 2 rushing team (303 ypg), will play in the Lockheed Martin Armed Forces Bowl against Houston. Monken, also a finalist in 2017, has seen his team drop games to only Duke and Oklahoma this season. The Sooners had to go to overtime before prevailing, 28-21, in Norman and the Black Knights have not lost since. Lincoln Riley, Oklahoma: The second-year head coach has taken the Sooners to back-to-back 12-1 seasons and College Football Playoff berths. Behind Heisman Trophy hopeful quarterback Kyler Murray, the Sooners have one of college football’s all-time most prolific offenses. The Sooners, No. 4 in the College Football Playoff’s final rankings, defeated Texas in the Big 12 Championship Game and will face Alabama in a College Football Playoff semifinal in the Capital One Orange Bowl. Riley was also a finalist last season. Nick Saban, Alabama: The Crimson Tide has been the dominant team of the 2018 season and enters the College Football Playoff as the top seed. The Southeastern Conference champions (13-0) will seek to repeat as national champions and start that quest in the Capital One Orange Bowl against Oklahoma. Saban, a five-time finalist for this award, has done a masterful job of keeping a heavy favorite on track despite a nagging injury to his star quarterback Tua Tagovailoa, a Heisman Trophy favorite. While at Alabama, Saban claimed the award in 2008 and also won the award in 2003 while at LSU. Dabo Swinney, Clemson: Swinney has the Tigers in the College Football Playoff for the fourth straight year with a fourth straight Atlantic Coast Conference championship and a 13-0 record. Swinney is now a four-time finalist for the award (previously in 2011, ’15 and ’17), but has never won it. The Tigers will face Notre Dame in one semifinal the Goodyear Cotton Bowl on Dec. 29 in their first appearance in the Texas-based bowl since 1940. The Tigers are the No. 2 seed in the College Football Playoff. Jeff Tedford, Fresno State: In his second season at his alma mater, Tedford took the Bulldogs (11-2) to the Mountain West Conference championship with a 19-16 overtime victory at Boise State. That victory, which avenged a previous loss to the Broncos this season, earned Tedford’s team a berth in the Mitsubishi Motors Las Vegas Bowl against Arizona State. Tedford was also a finalist last season when his Bulldogs made one of the top turnarounds in college football. Fresno State’s only other loss this season was at Minnesota, 21-14. The Allstate Sugar Bowl has established itself as one of the premier college football bowl games, having hosted 28 national champions, 93 Hall of Fame players, 49 Hall of Fame coaches and 18 Heisman Trophy winners in its 84-year history. The 85th Allstate Sugar Bowl Football Classic, featuring the Big 12’s Texas and Georgia from the SEC, will be played on January 1, 2019. In addition to football, the Sugar Bowl Committee annually invests over $1.6 million into the community through the hosting and sponsorship of sporting events, scholarships and clinics. Through these efforts, the organization supports and honors nearly 100,000 student-athletes each year and has injected over $2.5 billion into the local economy over the last decade. For more information, visit AllstateSugarBowl.org. 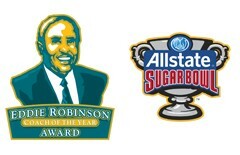 The Eddie Robinson Award is a member of the National College Football Awards Association (NCFAA), which encompasses college football’s most prestigious awards. Founded in 1997, the NCFAA and its 24 awards now boast over 800 recipients, dating to 1935. Visit ncfaa.org to learn more about our story.